Do You Need To Stay Connected While Travelling? This blog is really talking about leisure travel. Staying connected is probably a necessity if you are travelling on business. But when you head out for vacation, do you need to stay connected while travelling? Can you easily stay connected? There are reasons why you may want to disconnect. 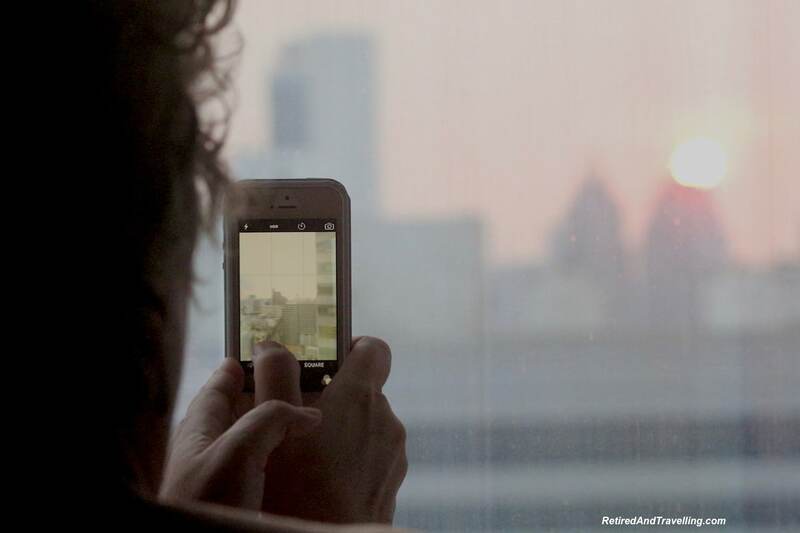 Staying in the moment without the distraction of online communication may let you enjoy travel moments even more. You may not want to be consumed with what is happening at home. You may not want to share your travels as you go. Sometimes you may just want to limit your online communication to specific times, modes or people. Most of the time, my desire is to stay connected while travelling. We have 3 young adult children scattered about Canada. They should feel they can get us if some emergency comes up. Neither of us have full time jobs that may introduce a crisis that will distract us. One of us is a bit of a news junkie! And the other one of us likes to update her social media channels as we travel! And of course, the more blogs that we publish while we are travelling, the less time we will spend when we get back home. By far, the easiest way to stay connected while travelling is to use wifi. You will probably have wifi at your hotel or cruise ship. It may not be fast or very good most of the time, but you can use it for basic email updates. 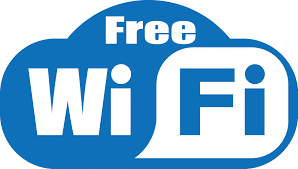 Most cities have large number of locations with free wifi. Most people go looking for coffee shops with free wifi. You may look for the library. Train stations and airports can help you when you arrive in a new town. Some towns are starting to have free wifi zones at key points around town. There are apps and web sites that can tell you where all the local free wifi hotspots are. The one big concern about free wifi spots will be security. Many will ask you to sign on with social media credentials like FaceBook. Don’t do it! You really do not know who you have given your identity to. Many will have no user id or passwords. That would make it easier for anyone to snoop on the electronic signal. I will preface this section by noting that telecommunications costs in Canada are some of the highest in the world. If you do not buy some kind of a travel plan, the per transaction costs are outrageous. I was travelling in the U.S. and thought I had all my data services off on my phone. Several days into my trip, I got a text from my cell company saying I had accrued $200 in data roaming charges and they were shutting off the data service until I asked to have them put back on. There are data roaming packages that can be added to your basic plan to stay connected while travelling. Of course, these are usually costs on top of your home plan that you are probably not using while travelling! The last time I took a roaming plan, I paid $70 for 200mB of data that mostly got used up in the cell phone doing internal checks. A half dozen tweets did not explain 200mB of data usage. You may be able to find a reasonably priced roaming plan that will let you stay connected while travelling. Typically this will give you phone and some data services. Certainly enough for casual or emergency access. But be very wary if you go over the base coverage. After than, per transaction costs could be very high. If your travel takes you only to one country, it may be easy and cheap to buy a local SIM to stay connected while travelling. The first key assumption here is that your phone is unlocked. If your phone is not unlocked, your first step before leaving home should be to get the SIM unlocked. Certainly in Canada this can be done. But there is usually a cost! In Canada, it costs about $50. We used a local SIM when we travelled in Italy. In advance of the trip we researched the various telecom carriers and the best SIM to buy. It worked great for most of the places we travelled on our 10 weeks in Italy. We also used a local SIM when we travelled to Australia. Since we headed from Australia to SE Asia for 4 weeks, it really would have been better to have an international SIM! From Canada, we often travel to the U.S. We purchased a dedicated RoamMobility SIM for connectivity in the U.S. We can top up our account before we travel and turn on the plan for the time we plan to visit. They offer the ability to buy a phone plan, add text and add data services. We will buy the plan that works best for the travel we are doing. When we travelled across the U.S., it ensured we were in touch along the way. The biggest thing to worry about with a local SIM is expiration. Typically you can buy plans as you go. You can stop the plan when you want it. But the SIM will typically expire after a period of having no plans attached. If you visit a particular place after the SIM has expired, you will need a new one. 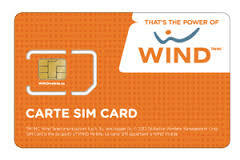 However, the cost of the actual SIM is usually quite low. We have used all of the above options to stay connected while travelling. 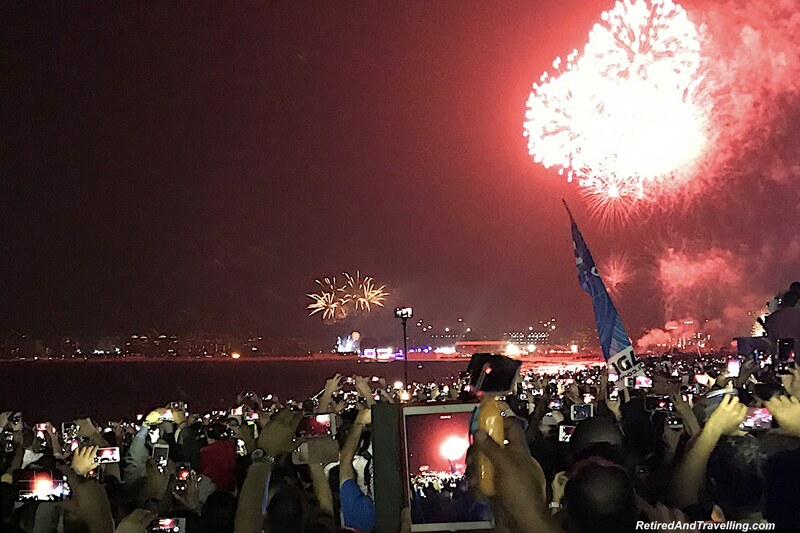 Travelling almost around the world in 2016, it would have made no sense to address connectivity needs in each country. Two different options provide us with the flexibility to deal with both casual and more extensive connectivity needs. 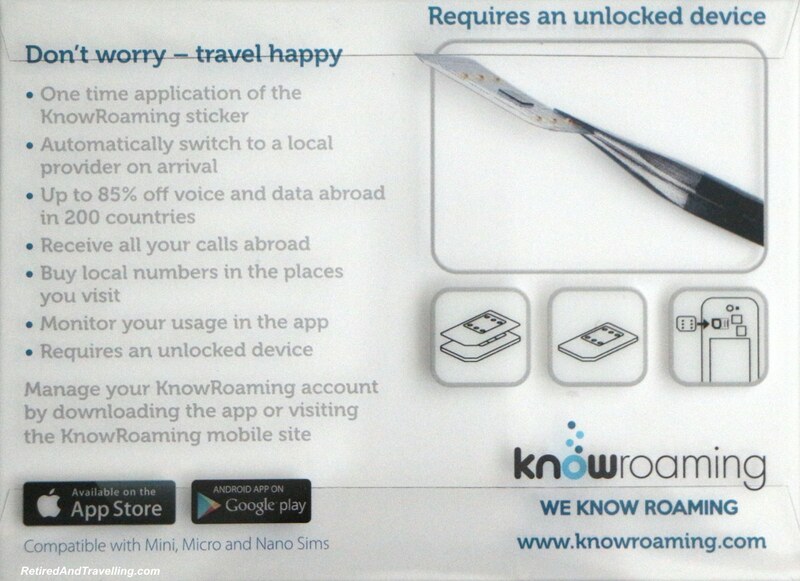 The first thing we bought was a KnowRoaming international SIM sticker. 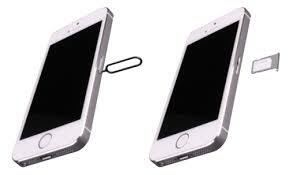 A thin film which is applied over your home SIM. The installation was simple with a molded frame to help with proper palcement. 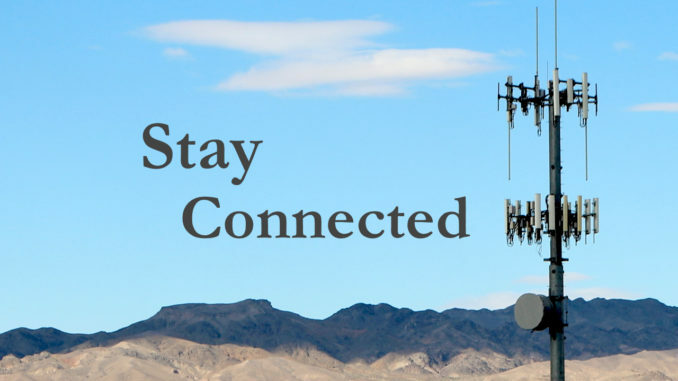 The international SIM is smart enough to know when you are in your home area or when you are in a remote location. It will automatically connect to a broad set of international locations. Because this is on your cell phone, you have options to get phone, text and data services. You can use pay-as-you-go rates or get daily plans that include unlimited data. The ability to use your phone as a hotspot is determined by the local telecom company rules. You may just have connectivity on your phone. KnowRoaming also offers international SIMs. The second device we invested in was a TEP Wireless hotspot. We chose to buy our device and pay for usage only. TEP Wireless also offers device rental if you want it for one specific trip. This device will automatically find local network services when you turn it on. You confirm if you want to connect. You pay a daily fee for unlimited data. The device provides a wifi hotspot and you can connect up to 5 devices. This option does not support voice or SMS-based texting. We a calling app like Skype to make phone calls and a data-based text program (like iMessages or WhatsApp). Which International Option Do We Use? Prices vary by country. It depends on agreements negotiated with local telecom companies. Availability of service varies by country. In some countries, I could use both devices. Some countries supported one device and many countries have no support yet. Neither solution was perfect all of the time. Daily rates include unlimited data. Speed and connectivity totally depends on the cell network in the location where you are. Both offer 3G if it is available. The services work as claimed. They easily connect to local telecom services. Is the international device supported in the specific country I am visiting? How broad is the coverage in the country? In many countries on our amazing 10 week journey, only the TEP Wireless device was supported. Do I need voice, text and data? If I need voice services, can I rely just on Skype? Since I have an iPhone, iMessages works just fine as long as I have data services. Am I able to carry a separate hotspot device? 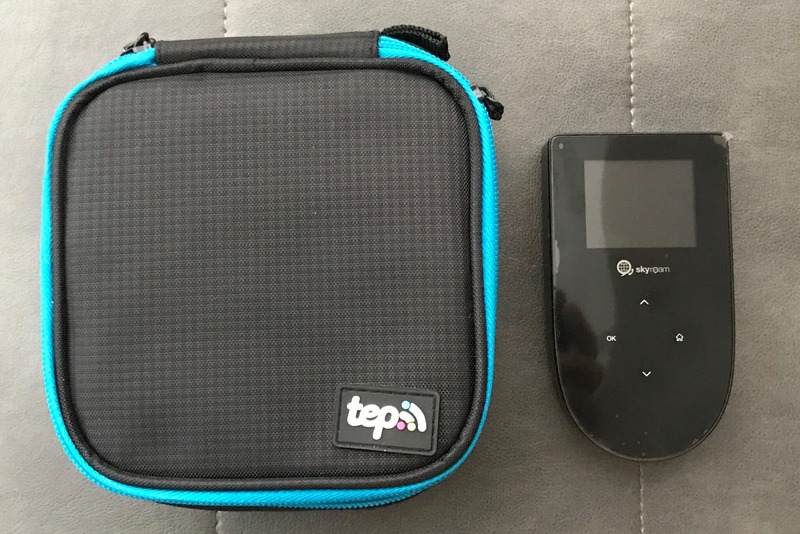 The TEP Wireless device is pretty small and portable. If I really want service all day, I also need to be able to carry portable power. Do I want full, unlimited data services or just intermittent access? If I really only need to check in periodically, I would normally just use the KnowRoaming SIM and pay per transaction. Both devices work if unlimited data is required. If we are using multiple devices, then the TEP Wireless device is a better option (if I can’t use my iPhone as a hotspot). You may choose to not stay connected while travelling. Checking in periodically when you have wifi connectivity may be all you need. If you travel periodically, you may be ok with a local SIM or even with a roaming package from your home cell phone provider. But if you travel a lot and travel to multiple international destinations, you need a flexible international option. I don’t want to be searching for or carrying multiple SIMs when I am moving from country to country. 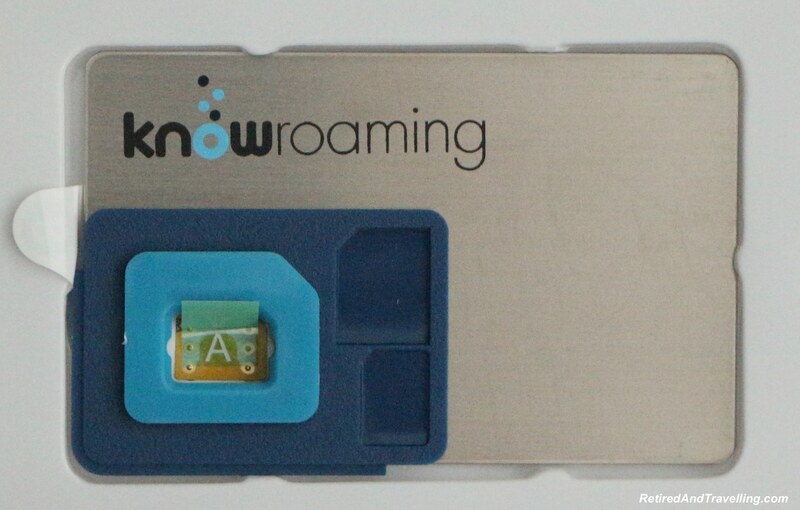 Both the KnowRoaming and the TEP Wireless international options work well. On our last major trip travelling to 16 countries in 10 weeks, I used both international options. I will continue to travel with both devices and assess which one makes more sense based the needs for that day. They will both be travelling with me in 2017 on our spring trip from the Caribbean to Portugal and Spain! 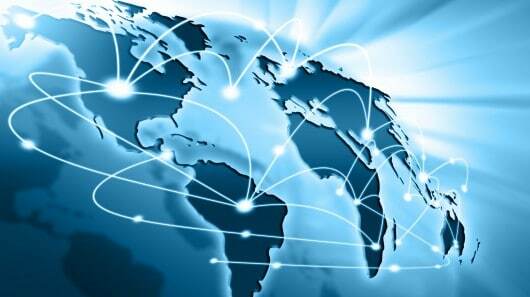 We have also invested in a good VPN to protect all of our internet traffic when travelling. This should all ensure we stay connected while travelling! Do you stay connected while travelling? Is there another option that you use to stay connected? If you stay disconnected, what is the major driving reason? Note: I do receive a small wireless credit if you purchase through the links on this blog. All opinions are mine and based on use of both products.